Derrick Kosinski & Scott Yager are joined by Johnny Bananas. War of the Worlds has been the highest rated season of The Challenge in quite some time. It is also the first time a season has begun with four Challenge champions eliminated in the first four episodes. After Ashley Mitchell went home in the first elimination of the season, Johnny Bananas (@JohnnyBananas) followed, having been thrown in by his lifelong rival Wes and defeated by his presumed ally, Zach. Johnny returns to ... Más informaciones Challenge Mania to talk to Derrick (@DerrickMTV) and Scott (@SHOTOFYAGER) about the slew of new talent entering the game, what went wrong for him this season, why his alliance with Zach fell apart, why he still believes Zach was working with Wes even after seeing Zach call out and be defeated by Wes this past week, whether he and Morgan are currently dating, who did and didn't impress him out of the rookies this season and MUCH MORE! 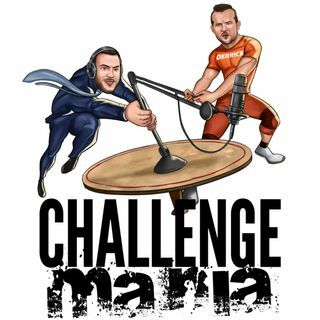 For MORE Challenge Mania including our exclusive bonus podcast series THE WAR ROOM, where we break down each episode of War of the Worlds right after it airs, head to www.Patreon.com/ChallengeMania and consider joining THE POD SQUAD! Play in our FREE BASKETBALL CONTEST this Friday, March 15th over at DraftKings and win cash from DK as well as a limited edition Challenge Mania shirt you cannot buy at our Shop! Play at dkng.co/challengemania - Terms and Conditions apply, see the site for details! Spend $25 at HogansBeachShop.com and receive a FREE HULK HOGAN BANDANA if you use the code CHALLENGE! Meet Hulk at Hogan's Beach Shop in Clearwater, FL on Saturday, March 23rd from 12pm - 2pm. Care/Of Vitamins are giving Maniacs 50% off their first order. Just go to www.TakeCareOf.com and use the code CHALLENGE50. BetterHelp is an affordable online counseling option. They are giving our listeners 10% OFF at www.BetterHelp.com/MANIA with the code MANIA.